Indian Lotus or Egyptian Bean provides edible fruits, young leaves, flowers, stems, rhizomes and seeds. It is sacred to both Hindus and Buddhists. 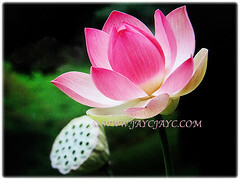 Nelumbo nucifera is the national flower of India and Vietnam. 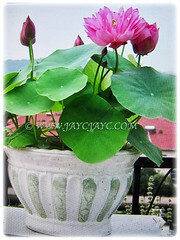 Botanical Name: Nelumbo nucifera (syn. : Nelumbium speciosum, Nymphaea nelumbo). 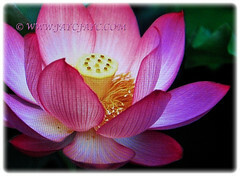 Common Names: Indian Lotus, Sacred Lotus, Sacred Water Lily, Egyptian Bean, Lotus, Teratai in Malay. Etymology: The genus name Nelumbo comes from the Sinhalese name. The specific epithet nucifera means fruits are a conical pod with seeds contained in holes in the pod. Origin: Native to tropical Asia and Queensland in Australia. Plant type: A herbaceous and an aquatic perennial plant. Features: Nelumbo nucifera is from the genus Nelumbo that consists of 3 accepted species of flowering plants. Normally, the plant grows up to a height of about 150 cm and a horizontal spread of up to 3 m.
It’s a moderate-growing plant with rhizomes that are grown firmly in the mud at the bottom of shallow ponds. The large and peltate (with the leaf stalk attaching to the centre) leaves, 60 cm across rise above the water surface on 1-2 m long petioles. The simple foliage with entire margin are coloured green to bluish-green. Large, fragrant and ornamental flowers can be up to 20 cm in diameter and are usually found on thick stems rising several centimetres above the leaves. A free-flowering plant with pink and white flowers that are solitary and located terminally. Eventually the flowers will be followed by fruits that develop above water. Its fruits are a conical pod with seeds contained in holes in the pod. When the seeds are ripe, they become loose in the pod and then tips down towards the water, releasing the seeds. Mature fruit is white with numerous seeds. 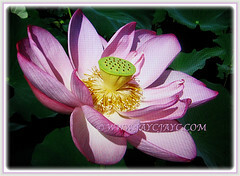 Culture (Care): Nelumbo nucifera or Indian Lotus can be easily grown with least maintenance. 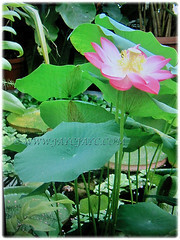 Lotus plant should be fertilised sparingly as too much fertiliser may cause its foliage to burn. Generally free from serious garden pests and diseases. Nonetheless, do watch out for sucking insects, several winged aphid species, white flies and red spider mites. For subtropical and temperate regions: Hardiness: USDA Zone 4-11. 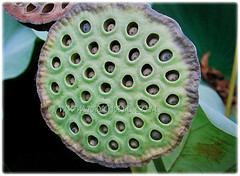 Nelumbo nucifera or Indian Lotus are found in tropical to warm temperate climates, in a range of shallow wetland habitats including floodplains, ponds, lakes, pools, lagoons, marshes, swamps and the backwaters of reservoirs.It is not seen blossoming in winter as it’s intolerant to cold weather. It is winter hardy to zone 4 as long as the roots do not freeze. Lotus can winter over in the pond if the depth of the pond is below the freeze line. During fall, containers submerged in very shallow water (less than 15 cm) should be moved into deeper water or brought indoors to other frost-free area for overwintering. In late fall, the yellowed foliage should be cut off and the plant lowered to the deepest part of the pond. Propagation: Easily propagated from seeds or division. 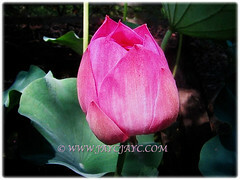 Usage: Nelumbo nucifera or Indian Lotus provides edible fruits, leaves, flowers, stems, rhizomes and seeds. Its young leaves, leaf stalks and flowers are eaten as vegetables. The rhizomes are used as vegetable in soups or stir-fried. Young lotus stems are used as a salad ingredient and the seeds can be eaten raw or dried and popped like popcorn. They can be boiled with dried longans to make a dessert or made into a paste. 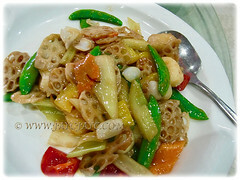 Lotus seed paste is the most common ingredients used in pastries such as mooncake and rice flour pudding. The large leaves are used to wrap food such as in lotus rice. Researchers report that the lotus has the remarkable ability to regulate the temperature of its flowers to within a narrow range just as humans and other warmblooded animals do. Its dried seed heads which resemble the spouts of watering cans are widely sold throughout the world for decorative purposes and for dried flower arrangement. The entire plant is used medicinally by the Chinese. The plant itself is prescribed as an antidote for mushroom poisoning. The rhizomes or leaves are used with other herbs to treat sunstroke, fever, diarrhoea, dysentery, dizziness, vomiting of blood and hemorrhoids. The embryonic seeds for high fever, cholera, nervous disorders and insomnia. Its seeds are used to stop vomiting, relieve indigestion and diarrhoea or just as a tonic. The flower stalks are used for excessive bleeding from uterus.